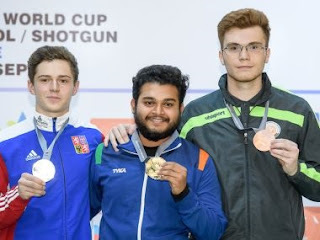 Young Indian shooter Subhankar Pramanick clinched the gold medal in 50-metre rifle prone event at the ISSF Junior World Cup for pistol, rifle and shotgun at Gabala in Azerbaijan on 18.09.2016. The Indian shot 205.5 overall to finish top of the podium. Czech Republic's Filip Nepejchal (205.2) followed in second position, while Romania's Dragomir Iordache (185.1) was placed third at the end of the finals. A total of 279 junior athletes, representing 27 countries, are battling it out in 18 events.